The Chinese Dragon Boat Festival is traditionally held on the 5th Day of the 5th Lunar Month of the Chinese Calendar. It is a festival of major significance for the Chinese people and has been celebrated for more than 2000 years. Greater Boston possesses a significant Asian-American population, with the Chinatown District in Boston being the mainstay community in the state. This year's festival will take place on Sunday June 9, 2019 from 12:00 pm to 5:00 pm. 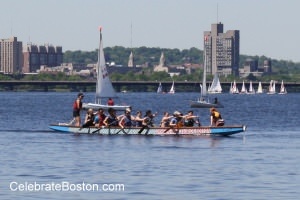 The dragon boat races take place along the Charles River near the campus of Harvard University, with nice viewing from both sides of the river. Time trials for the races take place on Saturday, with the official Dragon Boat tournament taking place on Sunday. The celebration of Asian culture occurs on Sunday at Riverbank Park in Cambridge, with a tent and open-air plaza setup for the festival. There are live dance and music performances, martial arts demonstrations, and various arts and crafts displays. Asian food and treats are featured from several vendors that line the plaza. The festival is a family-friendly event, and showcases Boston's great diversity. What is the origin of Chinese Dragon Boat Racing? The most popular legend is that of Qu Yuan, a minister of the state of Chu. Chu was one of seven states who were at war from 476 BC to 221 BC during the Warring States Period in Chinese history. The patriotic Qu Yuan wanted to fight against the powerful state of Qin. His proposals faced strong opposition, especially from a powerful aristocrat named Zi Lan. Zi Lan slandered Qu Yuan, which caused him to be removed from his ministerial post and be exiled from the capital by the emperor. Qu Yuan's exile did nothing to lessen his love for his State and inspired him to write many poems expressing his feelings for his country. Qu Yuan's works include: Li Sao (Nostalgia), Tian Wen (Query Raised to Heaven), Jiu Ge (Nine Songs) and his final poem, Huai Sha (Changsha Regret), which are now considered some of the greatest poems in Chinese literature. Qu Yuan's last poem was written after learning that the powerful Qin army had captured his beloved capital of Chu, in 278 BC. Unable to bear the sorrow of the news, he committed suicide by throwing himself in the Miluo River. Qu Yuan's followers were very distraught about his death, and desperately tried to find his body so they could give him a proper burial. They paddled their boats up and down the river, throwing rice cakes wrapped in bamboo leaves, known as Zongzi, into the water for the fish to feed on instead of destroying their hero's body. They also splashed the water with their paddles, and beat their drums, to ward off evil spirits and protect his body. Every year since that time, the Chinese people commemorate the anniversary of Qu Yuan’s death by taking part in Dragon Boat races. The festival is also used as an opportunity to ward off evil spirits and bring good fortune. Adults drink Xiong Huang wine, and children wear talismans in the form of perfume sachets to dispel evil spirits. People traditionally eat the Zongzi stick rice dumplings, and also hang them on their doors, with fragrant herbs and reed branches, to expel evil and induce good fortune and good health. Dragon Boat racing today is not only an important traditional Chinese event, but has also become an international sport. Other nations like Vietnam and Korea celebrate this tradition as part of their cultural sharing with the Chinese people. Asian populations all over the world now celebrate the life of Qu Yuan in the form of Dragon Boat Festivals in addition to the races.